Costa sunglasses are designed to excel in the water environment. Whether you boat, fish or just enjoy sunbathing around the pool or surf, Costa sunglasses are specially designed for the unique demands of sun and glare around water. All Costa sunglasses feature 100% polarized and UV blocking lenses. In addition, Costa sunglasses block the majority of the High Energy Visible Light, or HEVL, centered between 400nm and 500nm. This short wavelength blue light has been connected to the formation of cataracts and macula degeneration. 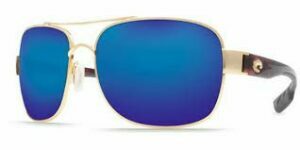 Many Costa sunglasses feature patented color enhancing technology, and are available in both scratch resistant glass (580G) and light weight resin (580P) lens choices. Additional glare protection is available by choosing a silver (amber base color), green (amber base color) and blue (grey base color) mirrored front filter. We are proud to be a Premium Costa Dealer, featuring more than 90 styles on display. We also can prepare prescription Costa sunglasses, using authentic and patented Costa lens technology in both glass and high-impact trivex material choices.